On February 11th, I set off on the train from Leeds to join a group of fellow YTI members for a visit to the Bedern Glaziers Studio (http://www.yorkglazierstrust.org/). This disused medieval chapel was converted by York Glaziers Trust and is home to their team of glass conservation specialists, who are currently working to restore York Minster’s Great East Window. Due to the signalling problems affecting Leeds station and forcing our train to take a detour along a slower line, two of us arrived 10 minutes late and missed the beginning of the talk. Despite my concerns that I would then find it difficult to catch up, I was soon enthralled by this informative glimpse behind the scenes of glass conservation. Paints are primarily used to restore rather than repaint sections of the stained glass, the original paint being preserved whenever possible. The paints used in the restoration process are made from a powder of metal oxides comprising colours, ground glass and lead (as a result, masks and gloves must be worn, and blood tests taken regularly, as precautions against lead poisoning). These powders are then mixed with vinegar and lavender oil, allowing layers of paint to be built up on the glass without firing between layers, since the oil sticks to the vinegar to ‘set’ the colour. Painting tools include brushes made from badger or hog hair (for shading, stippling and washes), as well as an ordinary metal pin for painting highlights onto eyes and hair (a quill would have been used originally). Broken or damaged panels can nowadays be repaired using synthetic resins, the modern versions significantly superior to those used in the 1970s (which used to yellow in the sunlight) but still requiring UV protection. In the 50s and 60s, panels were routinely re-glazed using thicker leads, which were thought to strengthen the window but actually made it weaker and caused more damage due to the extra weight. Nowadays, it is unusual to re-glaze panels of stained glass, unless severely damaged. When necessary, 4mm-thick ‘H frames’ are used to make panels lighter and improve their aesthetic impact by obscuring less of the picture. The top and bottom of the sideways ‘H’ shape is known as the ‘flange’, whilst the middle is the ‘heart’. Panels are fixed in place by first framing them using a mechanical fixing made from non-ferrous (anti-rust) manganese bonds. This means that, in the future, they will be able to be removed far more easily for conservation purposes (originally they were fixed in place using pointing in the stonework). The talk was the perfect blend of technical information and anecdotal interest, interspersed with a chance to watch conservation work in action, with two other members of the YGT team working on cleaning and glazing processes on the other side of the glass screen. Each explained the work they were doing, and all three conservators were happy to answer questions before we left. They gave a real insight into their varied expertise and backgrounds (which include art, art history, glass conservation and archaeology) and the meticulous work they do day in, day out… not to mention the skills and patience involved, with one panel taking at least one full week to clean! We heard how the project aims to painstakingly restore as much of the original medieval glass as possible, using many of the same techniques but also taking advantage of modern materials and techniques in order to protect the window for many future generations. 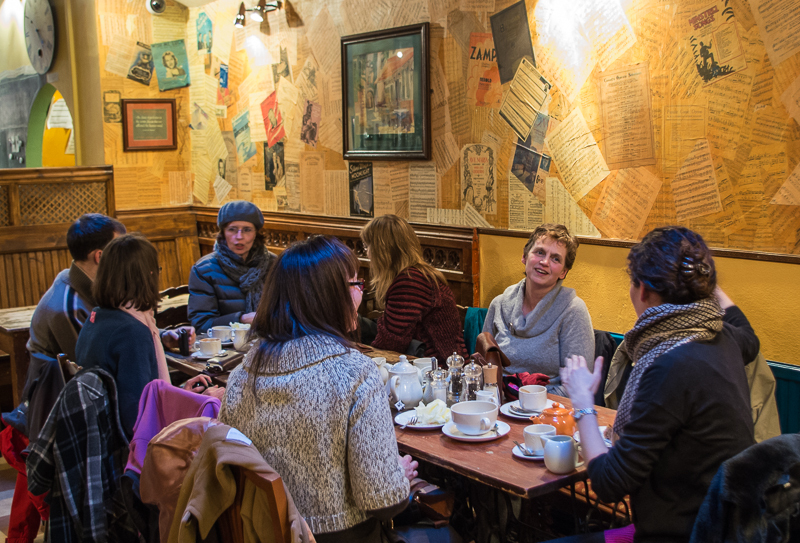 Everyone who convened at nearby Café Concerto to sample some of York’s finest coffee and cake agreed that the tour had been a thoroughly enjoyable, enriching and refreshingly different way to spend a Tuesday afternoon! A wonderful CPD idea – thanks to the organisers as always!